AES UK, the authorised UK distributor for Josam, explains how its equipment can help with body repair and maintenance. 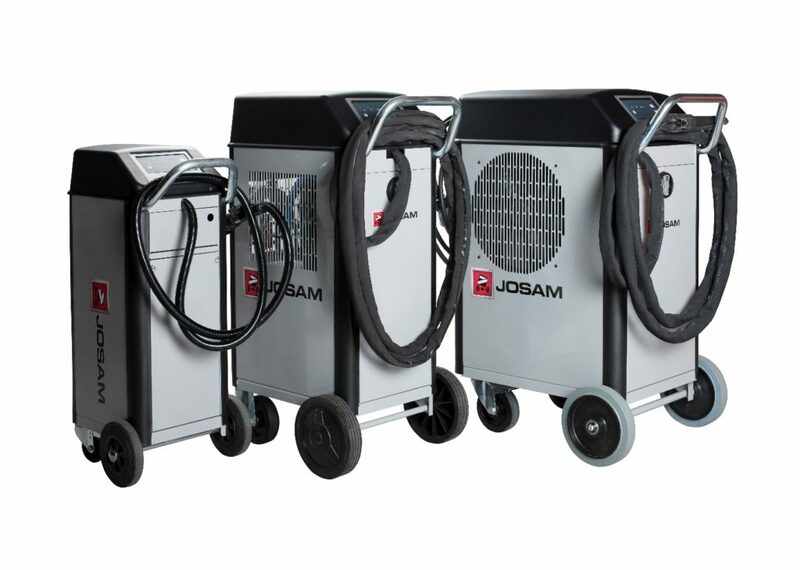 Investing in industry standard Josam equipment for bodywork ensures that a workshop has some of the best equipment on the market, coupled with bespoke onsite (off-site is also available) training which comes with all packages, and ensures that the correct repair methods will be adopted in minimal amounts of time. 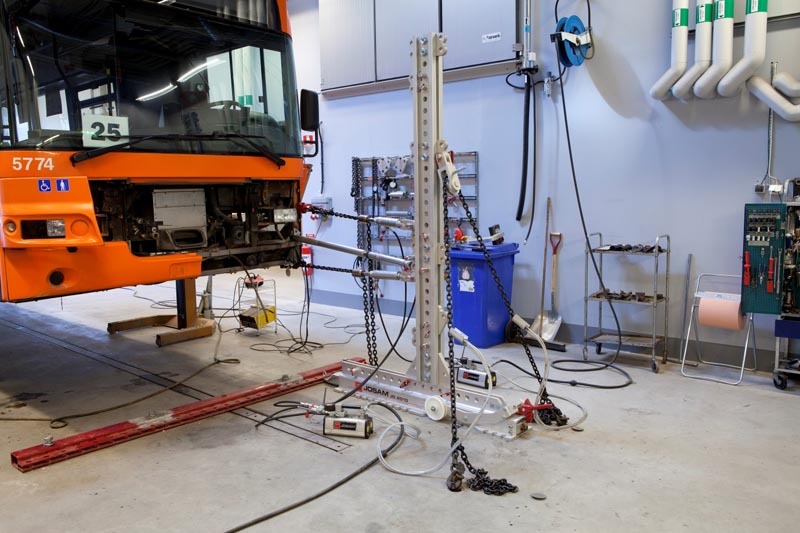 The Cab Tower is ideal for high pulling, such as on cabs and double decker buses. The unit, made from aluminium, works by using hydraulic pumps for pushing and pulling, ensuring that the most difficult of repairs can be carried out accurately in minimal time. The Cab Bench is a strong and stable aligning jig which simplifies cab repair. Moveable mounting points make it easier to mount even severely damaged cabs.The base of the cab is pushed and pulled hydraulically into its correct position. To make the repair process easier, and for many other uses, AES recommends a heat inductor. The induction heating process, aside from being much safer than gas, allows for a much quicker and more direct method of applying heat, meaning that surrounding paintwork and wiring remains safe, which saves time on preparation and repainting. Usage includes straightening, loosening of heavier vehicle parts and even sticker/vinyl removal. Go Ahead London, Mercedes EVO Bus and Richmond Coaches have recently purchased the Josam JH1000 based on the quality of the equipment, and in particular the long duty cycles allowed by the efficient cooling system. After all repairs, and any ongoing maintenance, alignment checks should be carried out. 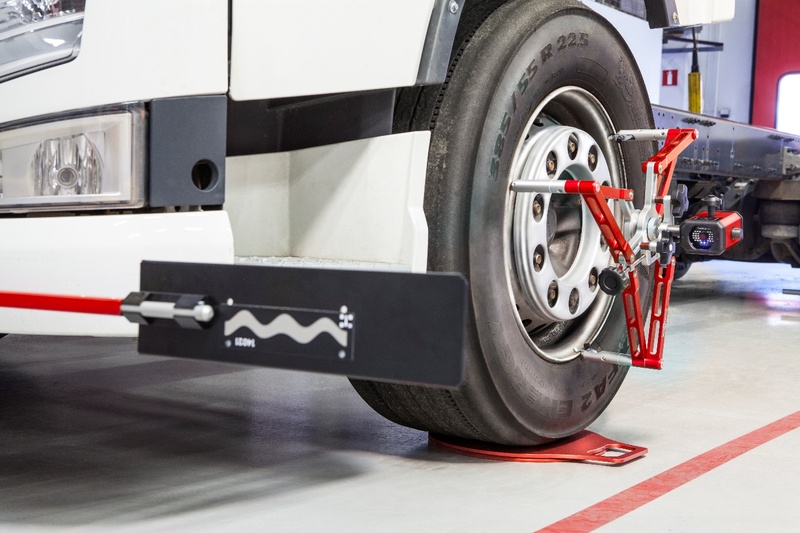 AES often finds issues with alignment on most commercial vehicles, but with Josam’s industry standard wheel alignment equipment, commercial vehicles can be measured and adjusted quickly. When it comes to wheel alignment, convenience is often the primary factor in terms of accuracy, speed and flexibility. ■ The Laser AM System is a laser-based alignment system with software and printout capability. It is budget friendly, can be upgraded to suit twin-steer vehicles and benefits from the ability to be taken mobile. ■ The Cam-aligner is a digital alignment system with rolling method and printout capability. 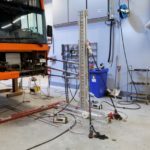 It benefits from a unique rolling method, which means users don’t have to jack axles to perform a run-out, wireless data transfer. The kit can be made mobile, and a live adjustment mode is featured for increased accuracy. ■ The I-track diagnostic alignment system is designed to diagnose a vehicle rapidly. It is Josam’s fastest system for wheel alignment diagnosing, fixed workshop bay, live adjustments. Why invest in Josam wheel alignment equipment? When combined with a good technician, the easy-to-use, versatile equipment can ensure savings on fuel and tyres resulting in a quick return on investment. A case study performed in the early 2000s by the Department for Transport, using Josam equipment, highlighted that a 1° misalignment on one axle could increase fuel consumption by around 5% and a 0.5° misalignment can reduce tyre life by up to 50%. Kidds Transport provided another example. The Lancaster-based company employed 30 drivers and ran a 12-hour operation from Monday to Friday at the time of the study. The rigid vehicles perform palletised daily deliveries on a multi-drop operation in and around Lancaster, Morecombe, Barrow and Kendal.